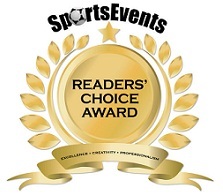 Eugene, Ore. - For the fourth consecutive year, Eugene, Cascades & Coast Sports is the recipient of a Readers&apos; Choice Award from SportsEvents Media Group, the leading industry publication that helps sports planners produce quality competitions around the United States. Sports event professionals were asked to nominate the organizations and sports venues that they believe displayed professionalism and creativity toward the groups they host. Readers submitted nominations throughout the year, and the top picks were selected based on the results from an online voting system. "Our team is proud to honor the nominees that received the most votes with a 2015 Readers&apos; Choice Award," said Kristen McIntosh, SportsEvents editor. "It is clear, based on our readers&apos; experiences, that these award winners are willing to go above and beyond typical service levels to help sports event planners produce outstanding events that participants, their families, and spectators will want to experience again and again. It is our privilege to announce their selection by sports event planners as among the best in the United States." Travel Lane County markets and promotes the Eugene, Cascades and Coast region as a destination for travel, conventions, meetings and events. It serves as a private, nonprofit association dedicated to economic development through visitor spending, which pumped more than $555 million into Lane County, Oregon&apos;s economy in 2012.